From the Department of Radiology, University of Minnesota Medical School, Minneapolis, MN. BACKGROUND AND PURPOSE: Posterior reversible encephalopathy syndrome (PRES) is typically characterized by headache, altered mental functioning, seizures, and visual loss associated with imaging findings of bilateral subcortical and cortical edema with a predominantly posterior distribution. Our goal was to determine whether fluid-attenuated inversion recovery (FLAIR) imaging improves the ability to detect subtle peripheral lesions of PRES, as compared with conventional MR techniques. METHODS: Sixteen patients with clinical and imaging findings consistent with PRES were studied. Thirteen patients had undergone transplantation and had cyclosporin A neurotoxicity. Fast-FLAIR images were compared with spin-echo proton density–and T2-weighted images. RESULTS: FLAIR imaging improved diagnostic confidence and conspicuity of the T2 hyperintense lesions of PRES, typically in the subcortical white matter of the parietooccipital regions bilaterally. On all 23 abnormal MR studies, FLAIR was judged superior to proton density–and T2-weighted images for the detection of PRES in the supratentorial brain. In a mean of 6.7 of 23 studies, FLAIR findings prompted a raise in the grade of disease severity. FLAIR also showed cortical involvement in 94% of patients with PRES and in a mean of 46% of the total lesion burden. In four cases, subtle lesions were virtually undetectable without FLAIR. Brain stem or cerebellar disease was encountered in 56% of patients. CONCLUSION: FLAIR improves the ability to diagnose and detect subcortical and cortical lesions in PRES as compared with proton density–and T2-weighted spin-echo images. We therefore believe that FLAIR should be performed in patients with suspected PRES to allow more confident recognition of the often subtle imaging abnormalities. Reversible posterior leukoencephalopathy syndrome is a recently proposed cliniconeuroradiologic entity with several well-known, as well as some more recently described lesser known, causes (1). There is some disagreement over what should be the proper name of this syndrome (2, 3) and whether it truly represents a leukoencephalopathy. We propose a new name, posterior reversible encephalopathy syndrome (PRES). The most common causes of PRES are hypertensive encephalopathy, preeclampsia/eclampsia, cyclosporin A (CSA) neurotoxicity (4–6), and the uremic encephalopathies (7). Given an extensive list of additional (although less common) causative conditions and pharmacological agents, we find the designation of a single syndrome, PRES, to be useful (1, 8). The clinical symptoms and neuroradiologic findings are typically indistinguishable among the cases of PRES, regardless of underlying cause. Patients have an acute to subacute neurologic presentation, usually complicating acute medical illness or treatment with immunosuppressive drugs. Most patients are markedly hypertensive at presentation, although some have only mildly elevated or even normal blood pressure (1, 8). Symptoms may include headache, nausea, vomiting, altered mental functioning, seizures, stupor, and visual disturbances. Although seizures have been reported to be associated with PRES, they are probably not by themselves (in the absence of other risk factors) causative of the syndrome but rather a result of the syndrome (9). On CT and MR studies, edema has been reported in a relatively symmetrical pattern, typically in the subcortical white matter and occasionally in the cortices of the occipital and parietal lobes. These findings occur to a lesser degree in the posterior frontal and temporal lobes, the corona radiata, the pons, the cerebellum, and other locations (1–6, 10–14). These often striking imaging findings usually are resolved on follow-up studies obtained after appropriate therapy. Clinical history usually allows further diagnostic categorization into the underlying causative conditions of PRES, but often the radiologist initially has insufficient clinical information. Occasionally, even after clinical correlation, a patient does not readily fit into a simple risk category (ie, the patient is not pregnant or postpartum, grossly hypertensive, or being treated with CSA). These patients often have multiple system disorders and may be receiving a variety of medications, many of which are risk factors for PRES. Moreover, because these patients may have only mildly elevated systemic blood pressure, the term hypertensive encephalopathy is an inadequate descriptor for their syndrome. It is these patients for whom the new cliniconeuroradiologic category and term PRES has the greatest utility. Since the lesions in PRES are typically in subcortical and cortical locations near the brain surface, detection with T2-weighted imaging is perceptually challenging in mild cases, owing to volume averaging of the hyperintense lesions with the adjacent bright CSF. The fluid-attenuated inversion recovery (FLAIR) sequence suppresses the signal of the adjacent CSF and therefore ought to render the lesions of PRES more conspicuous. We undertook this study to determine the utility of FLAIR MR imaging in detecting and evaluating PRES and in quantitating the brain distribution of these lesions. Eighteen consecutive patients with clinical symptoms and MR imaging findings (on any sequence) consistent with PRES were included in the study (see Table). One patient with white matter disease caused by adrenoleukodystrophy who had undergone bone marrow transplantation and who had superimposed findings of PRES was excluded to simplify evaluation. Likewise, a patient who had undergone renal transplantation and who had status epilepticus caused by CSA toxicity was excluded because of complications of respiratory arrest with superimposed hypoxic brain injury. Eight patients had follow-up MR imaging, and two of these patients had two follow-up studies. Three of these follow-up studies were completely normal and were excluded from subsequent analysis. MR imaging was performed with a 1.5-T unit, and all studies included axial turbo-FLAIR sequences (TR/TE = 6000/05, TI = 2000, acquisition time = 2:42, section thickness = 5 mm) and proton density–and T2-weighted spin-echo sequences (TR/TE = 2500/45,90; acquisition time = 7:04, section thickness = 5 mm). In one patient (case 9), FLAIR imaging was performed in the coronal rather than axial plane. For evaluation purposes, a single nonblinded neuroradiologist selected 23 of the remaining abnormal examinations that had been interpreted as showing PRES and mixed these studies with seven normal MR examinations (obtained for other indications). This investigator evaluated all abnormal studies on the FLAIR sequences to estimate the percentage of lesions within the cortex versus those in the white matter. Then, two other neuroradiologists separately evaluated all FLAIR, proton density–, and T2-weighted sequences in a double-blinded fashion to determine the location of lesions, the diagnosis, and the subjective severity of PRES findings on a scale of 0 to 3. Approximate guidelines for ranking the findings were as follows: 0 = normal; 1 = mild disease, in which subtle scattered foci of cortical or subcortical edema were present in the parietooccipital and/or posterior frontal regions with minimal mass effect and relative sparing of other regions; 2 = moderate disease, including more confluent obvious edema, mild mass effect, and some involvement of the frontal lobe or posterior temporal lobe, as well as possible subtle unilateral cerebellar or central involvement; and 3 = severe disease, in which there was confluent edema with mass effect and obvious spread to the frontal or temporal lobes and to any of the following areas bilaterally: central sylvian regions, brain stem, or cerebellum. Finally, all three neuroradiologists (with extensive experience in interpreting the imaging findings of PRES) directly compared the FLAIR, proton density–, and T2-weighted images for conspicuity of lesions and ranked each on a scale of 0 to 3 relative to one another, with 3 designating the greatest conspicuity. On all 23 abnormal studies, FLAIR was judged superior to proton density–and T2-weighted spin-echo images for the detection of supratentorial brain lesions in PRES (Fig 1 and Table). For lesions of the infratentorial brain, FLAIR imaging was judged equal or superior to proton density- and T2-weighted images in all instances except for two severe cases. In these two cases, one of three observers ranked the proton density–and T2-weighted images as superior to the FLAIR images, owing to the greater conspicuity of cerebellar lesions on the dual-echo images. This observer, however, still noted that FLAIR was superior for detecting supratentorial lesions in these cases. FLAIR was nevertheless found to be a useful sequence for lesions of PRES, even in the posterior fossa (Fig 2). In four patients, the FLAIR sequence was crucial for the diagnosis of subtle changes of PRES, although, in retrospect, the proton density–or T2-weighted images may have shown some very subtle abnormalities in the same locations (Figs 3 and 4). In a mean of 6.7 of 23 studies, FLAIR findings prompted a raise in the grade of disease severity as compared with proton density–and T2-weighted findings. In one follow-up study, the lesions appeared entirely reversible on the proton density–and T2-weighted images, but probable residual abnormality was subtly present in the cortex on FLAIR images. Case 12: 13-year-old girl with systemic lupus erythematosus who presented with hypertension and status epilepticus. MR imaging was performed 5 days later. A–C, FLAIR axial sections show extensive subcortical white matter edema bilaterally (arrows) with only minimal cortical involvement. Lesions are in the parietal, occipital, posterior frontal, and posterior temporal lobes and in the left corona radiata (asterisk). Additional T2 hyperintensity is seen in the white matter around the lentiform nuclei (arrowheads). Findings are consistent with typical changes of PRES, especially in the parietooccipital regions, and were considered moderate (severity index = 2) for the purposes of this study. D and E, Follow-up MR study obtained 150 days after initial neurologic examination reveals complete resolution of lesions on FLAIR images. Case 8: 48-year-old woman with history of vasculitis and chronic renal failure who presented with seizures. A, Initial MR study, FLAIR sequence, reveals typical subcortical edema of PRES in the left posterior frontal lobe (arrow). This patient also had mild cortical involvement of the parietooccipital regions, the left posterior temporal lobe, and the left thalamus. These findings were assigned a severity ranking of 2 (moderate disease). B, Follow-up FLAIR image 5 days after original presentation. Although the left posterior frontal subcortical edema has resolved, there was an overall progression of the findings of PRES with new right posterior frontal cortical hyperintensity (arrows). C, FLAIR image, at same level, 7 days after original presentation, shows mild worsening of edema, now bifrontal, with some new subcortical foci (arrowheads). D, T2-weighted image shows new bilateral cerebellar hyperintense foci (arrows). E, Cerebellar lesions are seen better on FLAIR image (arrows). This patient has parietooccipital lesions typical of severe PRES. Extension of edema to involve the cerebellum bilaterally was considered to warrant a severity index of 3 (severe disease). Case 4: 10-year-old boy being treated with CSA for bone marrow transplantation for acute lymphocytic leukemia. Shortly before imaging, the patient had two episodes of focal seizures and acute hypertension coincident with seizure activity. The serum CSA level was normal at the time the seizures occurred. Before the day of imaging, the patient had been normotensive. A, Axial proton density–weighted image. B, Axial T2-weighted image at same level. C, FLAIR image at same level as A and B reveals cortical T2 hyperintensity in a gyral pattern bilaterally in the occipitoparietal lobes (arrows). D, Axial FLAIR image, superior to A, suggests additional subtle cortical hyperintensity along gyri of the left parietal and posterior frontal lobes (arrows). This type of subtle cortical involvement was given a severity rating of 1 (mild disease). The use of FLAIR sequences allowed better characterization of the lesion location (ie, in the gray or white matter). White matter involvement, typically subcortical, was seen in 15 of 16 initial studies (94% of patients). 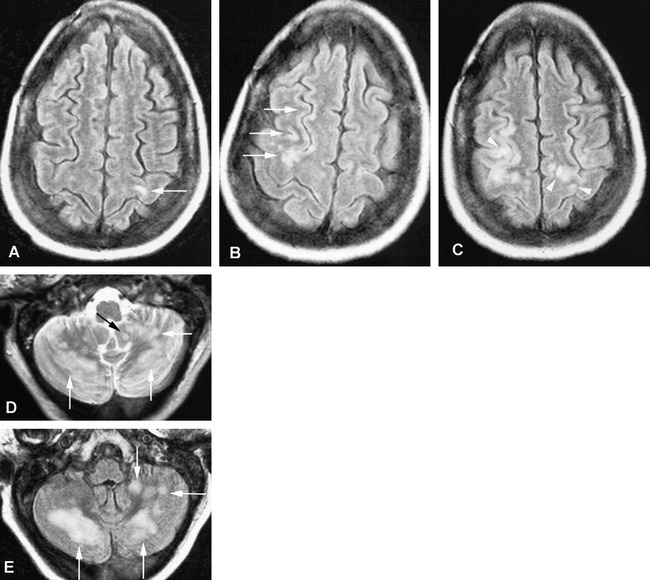 Despite the original description of PRES as a type of leukoencephalopathy (1), 15 of 16 initial studies (94% of patients) also showed cortical lesions. One patient had exclusive involvement of the cortex (Fig 3) and another had exclusive involvement of the white matter. Of the total number of identified lesions, an estimated mean of 46% involved the cortex and 54% involved the white matter. We noted that predominantly cortical involvement tended to be found more often in the mild cases while predominantly subcortical white matter edema was seen more often in the patients with moderate or severe disease (Fig 5). In some cases, follow-up examinations showed waxing and waning of lesions with variability between cortical and subcortical involvement (Fig 2). Brain stem (including thalamus) and/or cerebellar disease was encountered in nine (56%) of 16 patients. No instances of brain stem or cerebellar disease were missed on FLAIR images. Case 11: 48-year-old man being treated with CSA who presented with generalized seizures shortly before imaging. A and B, Proton density–weighted (A) and axial T2-weighted (B) sections reveal a nonspecific punctate white matter hyperintensity (arrow) in the left parietal lobe. C, Corresponding turbo-FLAIR image shows biparietal increased signal within the cortex (white arrows) and subcortical white matter (black arrow), representing edema and suggesting the radiologic diagnosis of PRES. 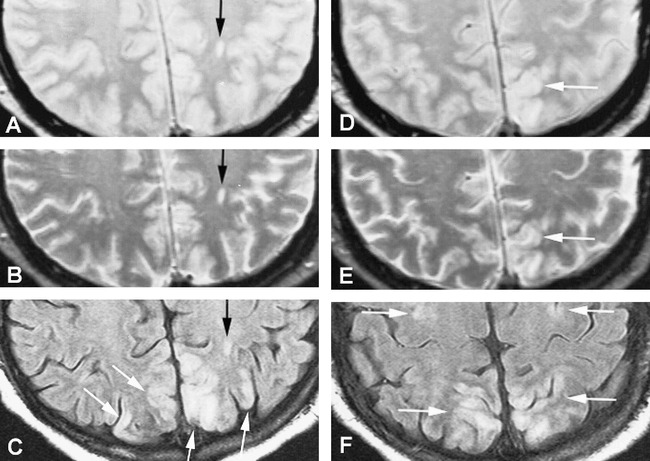 D and E, Adjacent proton density–weighted (D) and T2-weighted (E) images, one level superiorly, show increased cortical (white arrows) and subcortical white matter signal due to edema. F, Turbo-FLAIR image at same level again reveals the cortical-based hyperintensities that are difficult to appreciate on standard dual-echo sequences, owing to the adjacent bright CSF. FLAIR unmasks this abnormality by suppressing CSF signal. This case was assigned a moderate severity score on the basis of the FLAIR imaging findings, although on the basis of proton density–or T2-weighted images it would have been considered mild. Before or at the time of diagnosis of PRES, all patients were being treated medically for reduction of underlying risk factors and, if needed, for control of hypertension. For patients on CSA, this meant a reduction of dose or a switch to an alternative immunosuppressive agent. All patients eventually experienced clinical improvement of their symptoms of PRES. The pathophysiology of hypertensive encephalopathy and PRES has been studied extensively but continues to be debated. Two diametrically opposed theories exist. The earliest theory suggested that overreaction of brain autoregulation results in reversible vasospasm, which in turn results in potentially reversible ischemia to the brain, especially in vascular borderzone territories (15). This theory has been supported by occasional cases of large-vessel vasospasm encountered at catheter angiography and MR angiography, especially in patients with preeclampsia/eclampsia (16, 17). Most cases of PRES, however, are not associated with visible large-vessel vasospasm. Most investigators now favor a second, newer theory of hyperperfusion for the pathophysiology of PRES (18–22). Autoregulation maintains a constant blood flow to the brain, despite systemic blood pressure alterations, by means of arteriolar constriction and dilatation (23–25). It is well known from animal models that with spontaneous severe elevations in blood pressure, there is an upper limit to cerebral autoregulation. At this “breakthrough” point, constricted arterioles are forced to dilate because of the increased systemic blood pressure, resulting in brain hyperperfusion. This increased perfusion pressure is sufficient to overcome the blood-brain barrier, allowing extravasation of fluid, macromolecules, and even red blood cells into the brain parenchyma (26, 27). This has been shown to occur within the cortex of animals by means of Evan's blue dye extravasation. The cortex is more tightly packed and organized than the white matter, tending to resist accumulation of large amounts of edema. Progressive edema therefore tends to migrate to the subcortical white matter (28). Our findings of substantial cortical involvement on FLAIR images further support this pathophysiological theory (Figs 3 and 4). 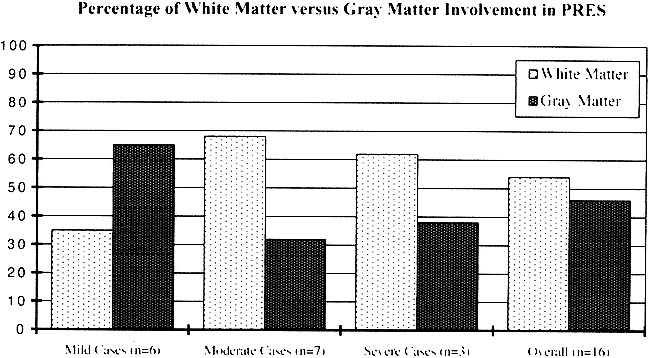 With FLAIR, we noted a tendency of the more mild cases to have greater involvement of gray matter than white matter. Before the advent of FLAIR imaging, such mild cortical cases of PRES might have gone undiagnosed (Fig 3). 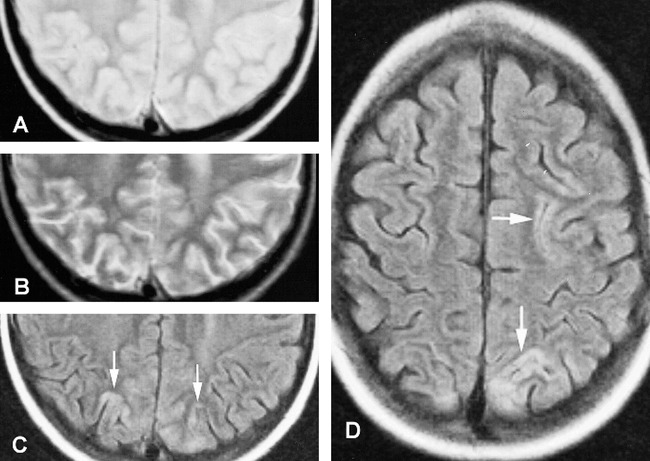 The increasing amount of subcortical edema seen in the more severe cases results in a smaller relative percentage of cortical involvement (Figs 1 and 2). Previous studies with proton density–and T2-weighted sequences alone may have resulted in a greater proportion of more severe cases being reported, which may account for the misperception that PRES is a white matter condition. Cases of PRES with subcortical white matter disease in the absence of cortical edema (such as our single case) are more difficult to explain. Perhaps upon treatment of hypertension, the edema within the cortex may clear faster than the subcortical edema. Pathologic reports in PRES typically have shown little or no evidence of infarction, instead revealing only interstitial edema, petechial microhemorrhages, and fibrinoid necrosis within the arteriole walls (1, 29, 30). The newer pathophysiological theory is further supported by recent experience with MR diffusion-weighted imaging and by reported apparent diffusion coefficient (ADC) alterations. Recent studies have suggested that lesions of hypertensive encephalopathy and PRES represent vasogenic rather than cytotoxic edema in the majority of cases (8, 31). We have used diffusion-weighted imaging in our study population with similar results but have encountered occasional complicated cases with demonstrable ischemia on ADC maps. Such experiences suggest that it is likely that not only hypertensive encephalopathy but also eclampsia, CSA toxicity, and the other causative factors of PRES conform to this newer pathophysiological theory. Further studies with various forms of perfusion-weighted imaging may shed additional light on the pathophysiology of PRES. Some of the pathogeneses of PRES, however, probably have additional superimposed mechanisms that complicate easy explanations. For example, it is likely that CSA has an additional effect on the blood-brain barrier, causing leakage at lower blood pressure levels than in pure hypertensive encephalopathy. Before 1996, the various causes of PRES were typically listed under the category of hypertensive encephalopathy or as separate entities (4–6, 9–14). While the majority of these patients have hypertension, patients are occasionally seen with only small blood pressure elevations above their usual baseline. 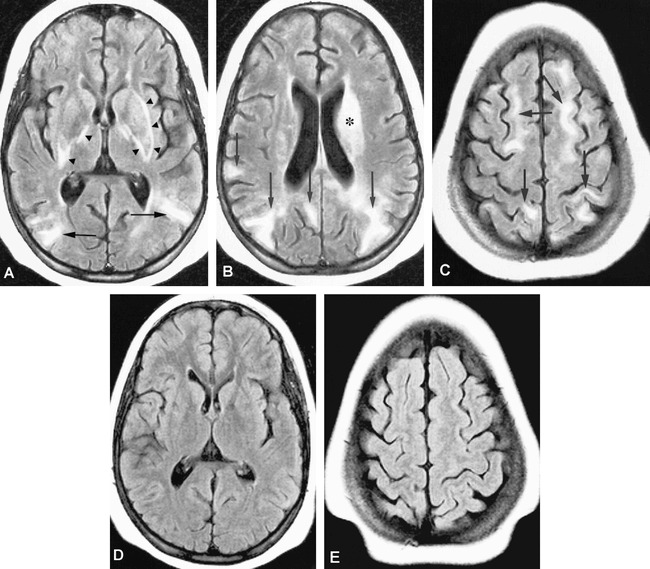 In 1996, the term reversible posterior leukoencephalopathy syndrome was coined by Hinchey et al (1) to encompass hypertensive encephalopathy and its related conditions in a single cliniconeuroradiologic syndrome; however, this term is misleading, as there is usually not an accompanying destructive process of the white matter, or leukoencephalopathy (2, 3, 8, 30). Furthermore, in our series, cortical involvement was seen in 94% of the cases and constituted 46% of all lesions (Figs 2B and 3). While occasionally the condition is not entirely reversible, and patients may have fatal complications, we do think that the term reversible is appropriate, since the lesions are predominantly reversible if prompt appropriate therapy is instituted. Although not all lesions are posterior, the tendency is for involvement of the territory supplied by the posterior circulation (Figs 3 and 4). Lesions of the anterior circulation tend to be seen only in the most severe cases and usually not without evidence of findings in the posterior circulation territories (Fig 1). We thus suggest the term posterior reversible encephalopathy (or edema) syndrome or, more simply, PRES. PRES has the advantage of an easily spoken mnemonic, which reminds one that elevated blood pressure is often an important underlying component. FLAIR is a routine clinical sequence in most practices with current MR scanners. FLAIR images are T2-weighted but have nulling of signal from CSF due to the inversion recovery technique. This allows for better detection of T2 hyperintense lesions of the cortex that often are obscured on conventional long-TR/long-TE sequences owing to adjacent hyperintense CSF. In 1997, Jarosz et al (12) reported three cases of CSA neurotoxicity in which they found the abnormalities to be more conspicuous on fast-FLAIR images than on conventional T2-weighted spin-echo images. In our study, turbo-FLAIR was found to be a useful sequence in the detection of changes of PRES and has become the key sequence in our MR protocol for suspected CSA neurotoxicity. In the four subtle cases, MR images would have been interpreted as normal without the FLAIR sequence (Fig 3). Although not proved in this study, we think that the early diagnosis of PRES, in some of our patients, resulted in prompter and more appropriate medical therapy. And the FLAIR sequences showed cortical lesions to be more common than previously thought. Recently, it was reported that there may be variations in cortical signal intensity on FLAIR sequences, depending on the age of the patient and the cortical location (32). For instance, the sensorimotor cortices tend to be less bright than the other cortices. Also, healthy children tend to have a brighter cortex, which decreases in cortical signal intensity on FLAIR images with advancing age, until the cortex approximates the signal intensity of white matter. We do not believe that this potential pitfall of FLAIR imaging has resulted in any false-positive diagnoses of PRES. Previously, the proton density–weighted sequence was reported as being useful in imaging lesions associated with cyclosporine neurotoxicity. Our blinded observers, however, found the proton density–and T2-weighted sequences to be nearly equal in sensitivity. This discrepancy might be due to equipment issues resulting in relatively bright CSF on our proton density–weighted images despite our use of typical imaging parameters (TE=22) for spin-echo proton density weighting. If CSF had been more isointense relative to normal gray matter, the proton density–weighted sequence might have been more sensitive to the detection of PRES lesions. One potential criticism of this study is that an MR imaging diagnosis of PRES was required for patients to be included in the study, and there was no reference standard, such as pathologic findings, for the diagnosis of PRES. In some cases, the initial diagnosis of PRES relied on abnormalities seen predominantly on the FLAIR sequence. The argument would thus be that the study methodology introduces bias in favor of the FLAIR sequence. Nevertheless, PRES is usually diagnosed or ruled in by imaging, especially by MR imaging. Typically, PRES may be suspected on the basis of history, but the clinical signs and symptoms are nonspecific. Often, for instance, before imaging, patients on immunosuppressants have received a differential clinical diagnosis of either CSA (or other drug) toxicity or intracranial opportunistic infection. Patients with severely elevated hypertension typically have been given a differential clinical diagnosis of hypertensive hemorrhage or hypertensive encephalopathy. Sometimes, the clinical signs and symptoms are consistent with PRES but the clinical diagnosis has not been initially considered (especially when the more obscure risk factors are involved). Imaging is thus an essential component of the diagnosis of PRES. When typical clinical risk factors are not present, or when the blood pressure is not dramatically elevated, improvement on follow-up MR studies may also be key in the diagnosis. Nevertheless, the study subjects were not selected on the basis of which sequence diagnosed PRES but only on an imaging diagnosis of PRES, by whatever means, in addition to a clinical scenario consistent with the syndrome. In fact, if all patients diagnosed only on the basis of FLAIR findings are excluded from the series, PRES lesions are still more prevalent on FLAIR images than on conventional images. Regardless of the name chosen for what we term PRES, recognition of the characteristic imaging findings by the radiologist is key in diagnosing this syndrome and should prevent unnecessary brain biopsies. If available, FLAIR should be used in MR protocols for suspected PRES, and may thus lead to prompter diagnosis and more appropriate therapy. FLAIR is the most sensitive sequence to the characteristic cortical and subcortical edema of PRES. The FLAIR sequence shows involvement of gray matter to be a much greater part of this syndrome than previously thought; the vasogenic edema may even originate in the cortex. The syndrome does not appear to represent a true leukoencephalopathy and we thus prefer a new name: posterior reversible encephalopathy syndrome (PRES). 1 Presented in part at the annual meeting of the American Society of Neuroradiology, Philadelphia, May 1998. ↵2 Address reprint requests to Sean O. Casey, MD, Department of Radiology, University of Minnesota, Medical School, Box 292, 420 Delaware St SE, Minneapolis, MN 55455. Accepted after revision January 27, 2000.